"Great twist to a BBQ classic!" Place cabbage and carrots in a colander and rinse in cold water; let drain for 5 minutes. Whisk rice vinegar, olive oil, and cilantro together in a large salad bowl. 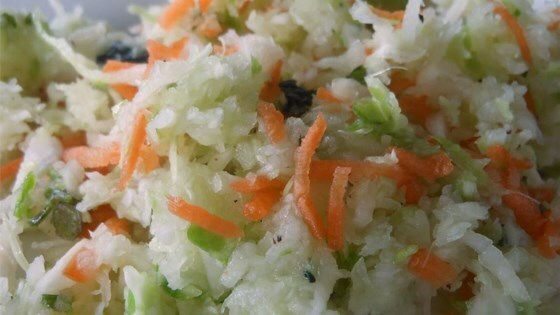 Stir cabbage and carrots into dressing; season with salt. Slaw can be served immediately or covered and refrigerated for up to 1 day. I made this exactly as written and found it to be bland. I added one teaspoon cumin, 2 chopped jalapeño peppers, seeds removed from one, the juice and zest of one lime. This is a good base but it lacked flavor. I added cumin and some pickled jalapenos and it made the dish much better.